Despite their great abundance, Centipedes (Chilopoda) have remained largely neglected in terms of their identification and study in Nottinghamshire and until only recently, there was very little information available regarding any of the county's species. 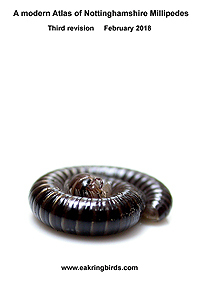 But thanks to Tony Barber of the British Myriapod and Isopod Group, it is now possible for us to produce and publish a long overdue modern atlas of Nottinghamshire Centipedes. Tony was kind enough to send us all the VC56 records which the BMIG held. Many were Tony's own records from his time living in Bingham, but P.E. Jones also did a great deal of recording in the same area of the county and at around the same time. 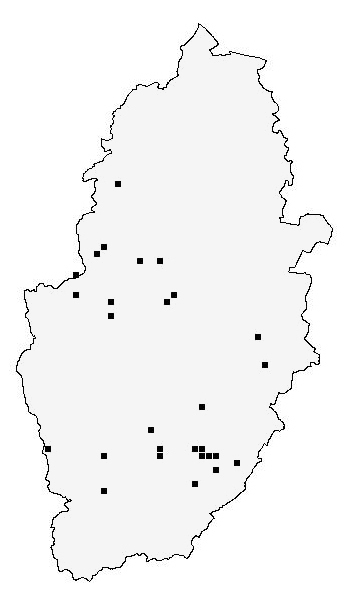 Records sent to us by the BMIG, coupled with those of other local naturalists and ourselves, means that we now have a continually improving idea of species distribution and status in Nottinghamshire, which is probably much better than many other Midland counties. 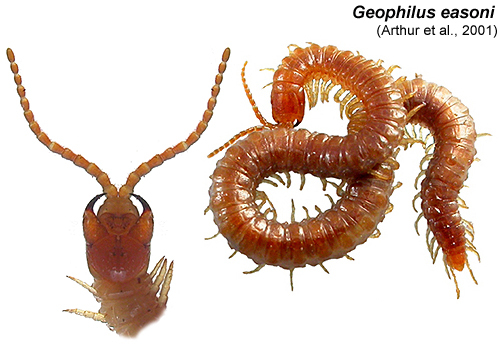 Centipede distribution does tend to reflect recorder location, so the distribution of some species can be quite patchy and not wholly representative of their distribution. Only recently recorded from Nottinghamshire (Sookholme Church in April 2015 and near Kirton in May 2016), Geophilus carpophagus has frequently been confused with Geophilus easoni in the past, and only recently have the two been considered to be separate species (Arthur, et al 2001). There is a previous record from Bunny Old Wood, but the recorder is unknown and there was no retained specimen. 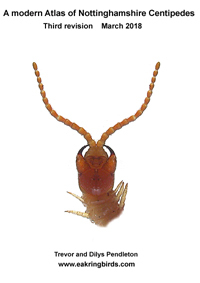 Geophilus carpophagus is not a woodland species, favouring more urban locations, where it can be found under loose mortar and brickwork on the walls of buildings etc. 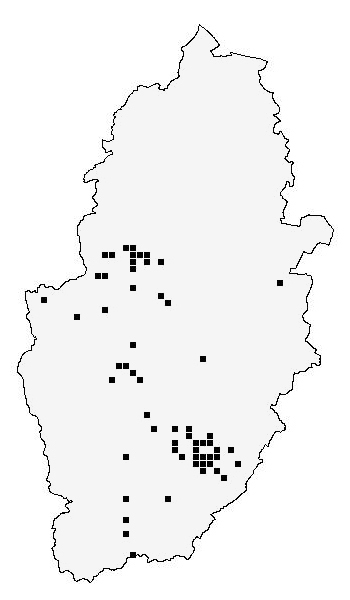 It is likely that most species listed as having occurred in Nottinghamshire are still present and widely distributed, its just that few recorders are regularly looking for them. On a cold, wet day in early March 2013, we brought home a carrier bag of leaf litter and moss collected at Sherwood Forest CP and promptly found Nottinghamshire's first record of Lithobius muticus. 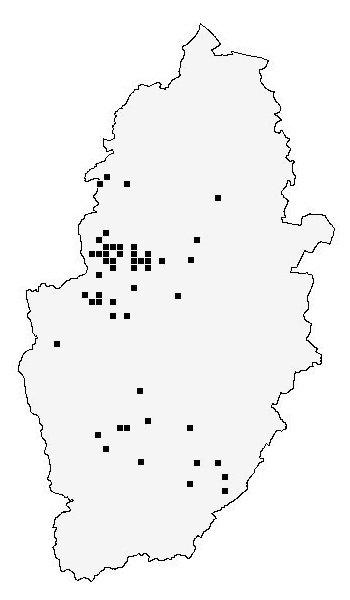 Keith and Belinda Lugg also recorded Nottinghamshire's first Cryptops anomalans from the grounds of Worksop Priory in August 2015, so there is little doubt that new species for the county are waiting to be found, even in suburban localities such as parks, gardens and Churchyards. The distribution maps are largely built from the records of Tony Barber, P.E. Jones and ourselves. We have avoided using historical records sourced from J.W. Carr's book The Invertebrate Fauna of Nottinghamshire", feeling that a modern atlas is more representative of the current distribution of our Centipede fauna and far more useful. The maps are up to date, as of November 2018. Nottinghamshire distribution: Considerably more widespread across much of Nottinghamshire. Frequent in gardens, where it is sometimes found deep within the soil, but more regularly under large stones. 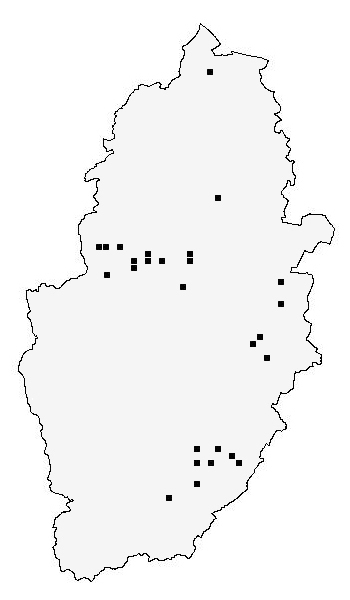 Nottinghamshire distribution: The distribution map suggests that this species has a southerly distribution in Nottinghamshire. Regularly recorded from the Bingham area (Jones, P.E.) in the late 1960's and 1970's. Two records from Market Warsop in 2014 and 2017, represent the most northerly county records. Nottinghamshire distribution: Uncommon. Most records are from the south-east of Nottinghamshire, but there is a recent record from Eaton Wood in 2013 (Pendleton, T.A. and Pendleton, D.T). 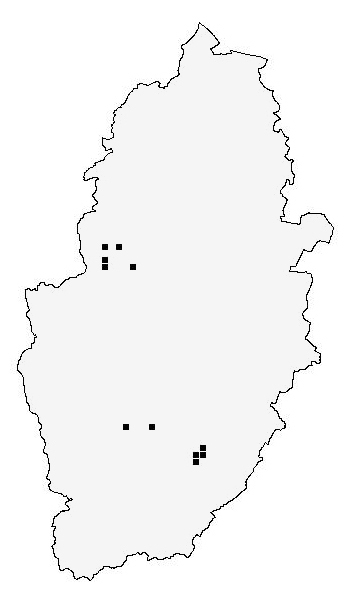 Nottinghamshire distribution: Geophilus carpophagus favours more urban locations, where it can be found underneath loose mortar and brickwork on the walls of buildings etc. Likely to be quite widespread in Nottinghamshire, but confirmed records known only from the walls of Sookholme Church in April 2015 and near Kirton in May 2016 (Pendleton, T.A. and Pendleton, D.T). 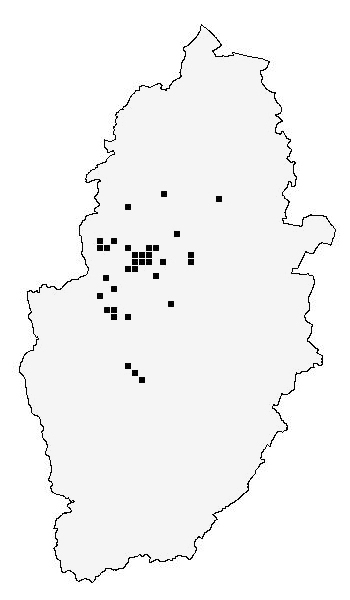 Nottinghamshire distribution: Widespread and often common at many lowland heath and woodland sites in central Nottinghamshire. We have no records from urban locations. Nottinghamshire distribution: For many years, Nottinghamshire's only record was from Bingham in 1968 (Jones, P.E.) but it was more recently recorded from Attenborough NR in November 2016 (Sexton, T.). Nottinghamshire distribution: Most common in the south-east of the county, with records from Newark in 1969 and 1970 (Jones, P.E.). More recent recording work has turned up records from Sherwood Forest, Kirton Wood and Wellow Park. (Pendleton, T.A. and Pendleton, D.T) Nottinghamshire distribution: Common and found in a wide variety of habitats. Well recorded from many sites in the Bingham and Trent Valley areas during the late 1960's and early 1970's, and now proving to be more widely distributed than previously thought. Nottinghamshire distribution: Common and widespread. Most often recorded from north of Nottingham, towards the Sherwood Forest area. Most of the known records are from sites lying on sandy soils. Nottinghamshire distribution: A single specimen found in the grounds of Worksop Priory on 22/08/15 (Lugg, K. and Lugg, B.) represented the first Nottinghamshire record. It was subsequently found at the same site the following year (Pendleton, T.A. and Pendleton, D.T), but has yet to be found elsewhere in the county. Nottinghamshire distribution: Most frequent around the Mansfield area, but probably widespread across much of Nottinghamshire. It can be found under stones and other debris, often on brownfield sites and in suburban gardens. Also well recorded from the Bingham area. 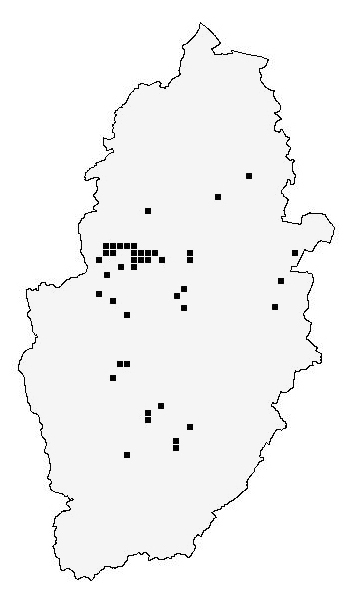 Nottinghamshire distribution: Recent records have come from heathland sites in the Sherwood Forest area, including Clipstone Old Quarter, Sherwood Heath SSSI near Ollerton and Strawberry Hill Heath near Mansfield (Pendleton, T.A. and Pendleton, D.T). There is a 1983 record from Bunny Old Wood in the south of the county. Nottinghamshire distribution: Must be considered to be rare in Nottinghamshire, as it was never recorded from the Bingham area, or anywhere along the Trent Valley by Barber, A. and Jones, P.E. in the late 1960's and early 1070's. There is a single record from Bunny Old Wood dated 1983, although the recorder is unknown. 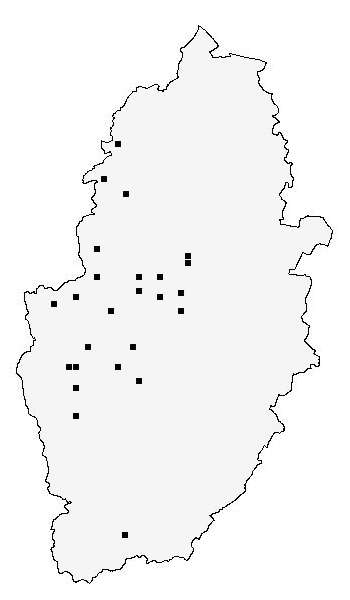 Nottinghamshire distribution: Probably much more common and widespread than the distribution map suggests. Well recorded from the Bingham area of south-east Nottinghamshire in the late 1960's and early 1070's (Barber, A. and Jones, P.E.) but frequent in the Mansfield and Sherwood Forest areas. 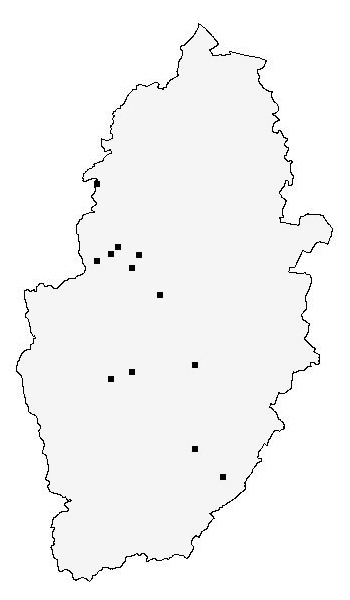 Nottinghamshire distribution: The most widespread of all the Lithobius Centipedes in Nottinghamshire. 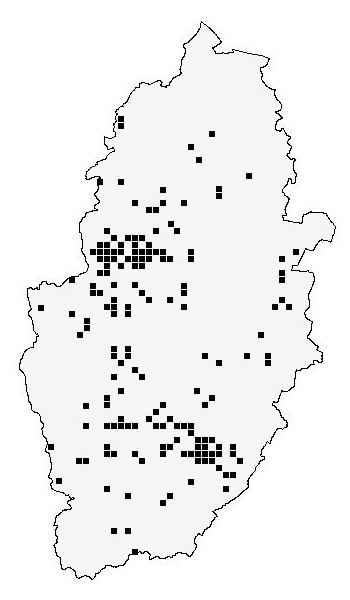 There are obvious concentrations of records from the Bingham and Sherwood Forest areas of the county, which have seen most recording. Frequently found in urban gardens. 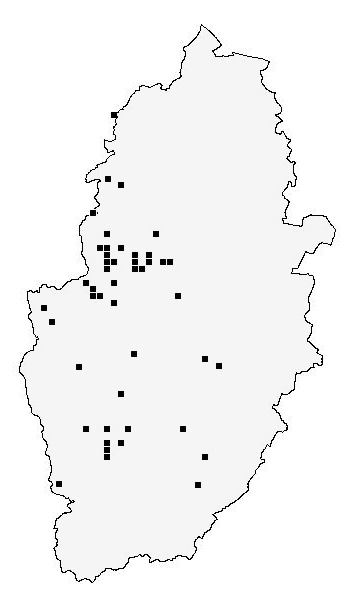 Nottinghamshire distribution: Relatively scarce in Nottinghamshire, but probably suffering from under-recording. There is a band of records running south-east to north-west across the county. Thanks to Tony Barber of the British Myriapod and Isopod Group, it has recently been possible for us to produce and publish, long overdue modern atlases of Nottinghamshire's Centipedes and Millipedes. Both are available as pdf files, but are quickly becoming out of date, following the recent increased interest in both groups. 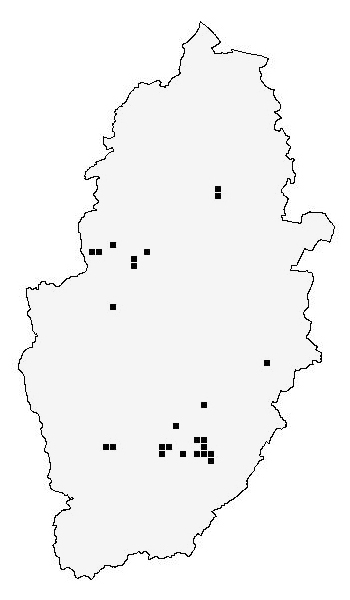 Records sent to us by the BMIG, coupled with all the recent records, means that we actually have a good picture of species distribution within Nottinghamshire and probably much better than many other Midland counties.